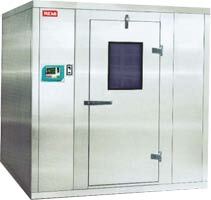 The REMI Walk in Cold Room and Cold Storage are designed for precise monitoring of temperature conditions required for cold storage of Bio samples at various organizations like Biotechnology, Foods, Pharmaceutical, Agrochemical manufacturing facilities. These are made by erecting PUF panels and manufactured as per GMP norms, provided with refrigeration system, including optional standby refrigeration system for uninterrupted functioning. Constant circulation of air throughout the chamber achieves homogeneous Temperature conditions. Audio-Visual alarm for temperature variations along with utility failures. Shuts off of Air heaters in case of temperature over shoots or under shoots. Complete operative secondary system which can be Auto / manual switch over. Histogram format of 24 hours. Microprocessor controlled refrigeration system provide temperature accuracy and reproducible results. Temperature range 2 °C to 8 °C, Accuracy ± 1⁰C. Suitable for long term Cold Storage requirements in Industry. Temperature and utility failures visual and audible alarms.